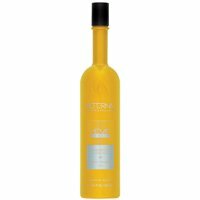 Alterna Hemp Repair Shampoo for stressed, chemically treated hair. Essential amino acids and other nutrients help prevent dryness and breakage, while adding softness and manageability. It is a gentle, sulfate free, daily-use formula that cleanses stressed, chemically treated hair without stripping vital moisture levels. Infused with the patented ultra-hydrating hemp seed oil and nutrient activating enzymetherapy complex, it showers hair with essential amino acids and other nutrients to help prevent dryness and breakage while adding softness and manageability. Fruit derived enzymes and powerful UV protectants work together to provide maximum color protection. Benefits: Strengthens hair with a protein/moisture balance. White Tea acts as a powerful antioxidant. Cleanses extremely damaged hair while delivering intense protein with moisture. Shields hair from damaging free radicals. For use on damaged hair. Directions For Use: Apply small amount of Shampoo to wet hair. Work into a rich lather, rinse and repeat if necessary. For best results, follow with Alterna Hemp Repair Conditioner.